Former British PM Tony Blair tells AIPAC conference Iran is key issue preventing conflicts in Middle East from being resolved. 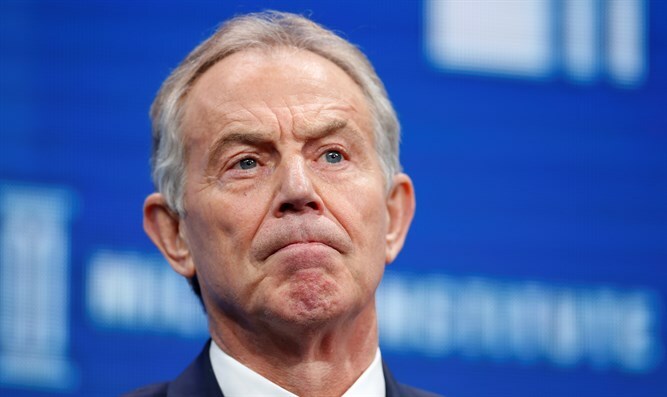 Former British Prime Minister Tony Blair called for a new approach to Arab-Israeli peacemaking, and blamed the Ayatollahs' regime in Iran for the intractability of the Middle East's problems at the AIPAC annual policy conference Sunday. “If you had a benign regime in Iran, all of the problems in the Middle East would be resolvable,” Blair said. Iran is involved in some fashion in numerous conflicts throughout the Middle East. It provides funding and weapons to the Hamas terrorist organization in the Gaza Strip, as well as to the Houthi rebels in Yemen, and controls the Hezbollah terrorist organization in Lebanon. Iran is also a key ally of Bashar al-Assad and has supported his regime militarily in the Syrian civil war which has claimed hundreds of thousands of lives. "We have to push back hard” against the Iranian threat, Blair said. Blair, the former Quartet envoy to the Middle East, also said that the time has come to find a “new way forward” on Arab-Israeli peace. He said that Israel and the Sunni Arab states must unite over common interests if they are to achieve true peace. “The key to transforming the Middle East is to have relationship between Israelis and Arabs which can be open, above the table, acknowledged in which Israel’s existence is accepted and Israel works closely with Arab states.